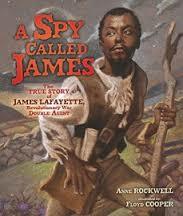 Rockwell, Anne A Spy Called James: The True Story of James Lafayette, Revolutionary War Double Agent, Floyd Cooper, Illus. Biography. Carolrhoda, 11/2016. pp. $17.99. 978-1-4677-4933-6. OUTSTANDING. GRADES 3-6. Rockwell’s succinct, second-sixth grade non-fiction read-aloud concerns James, an enslaved man living in Virginia during the American Revolution and his work as a double agent. James’s spying and misinformation were key in the pivotal loss General Cornwallis took at Yorktown. Floyd Cooper’s artwork is sensational and atmospheric, starting with the striking image on the cover. He excels at depicting light and capturing meaningful facial expressions. His illustrations expand upon Rockwell’s interesting and well-pitched narrative. In one memorable spread, James savors the moment where Cornwallis realizes who has deceived him. The afterword examines some of the fascinating tidbits researchers have gleaned about James, who adopted the last name Lafayette in honor of the revolutionary commander essential in his attainment of freedom (“Hamilton” tie-in!). Two points will likely lead to questions and spark discussion: 1) that slave owners could send enslaved men to fight for the Revolutionary Army in their place with the promise of freedom; and 2), that Black people could and did own slaves. After his own liberation, James owned land and slaves himself. Includes bibliography.